Grand View Women Headed to the Sweet 16! Solid win by the Grand View women’s basketball team (now 29-5) tonight in their 1st round game of the NAIA National Tournament in Sioux City. Beat the Flames of College of St Mary 68-52. The starters carried the load with Morgan Hamner scoring 17 points with 9 rebounds. Amy Vos added 16 points and 11 rebounds. Nicole Wilson chipped in with 13. Jenn Jorgensen scored 8 points and added 14 rebounds. (This is the first game this season that Jorgensen did not register in double figures). The Vikings jumped out to a quick 10 point lead in the early going 12-2 and although the Flames tied the game at 26 with 7:20 left in the half, Grand View never let St Mary take the lead. Nicole Wilson got GV out to that quick start scoring 6 of the Vikings first 10 points with two 3 point makes. St Mary came out firing from long distance as expected in the opening half drilling 7 of 15 from three point range, but still trailed at the break 36-29. The Vikings would shut down the Flames from beyond the arc in the 2nd half as they went 0-11, and finished the game 7 of 26. Now on to Friday and a matchup with Corban (Salem, Oregon) from the Cascade Collegiate Conference. The Warriors were the regular season conference champion and come into the game with a record of 24-7. Just like Grand View Head Coach Garey Smith, Corban Head Coach Terry Williams was named conference coach of the year. The Warriors edged out hard charging Point Park (PA) 60-58. It was their 1st ever national tourney win in 5 chances. Just like St Mary, Corban features 5 players who average double figures led by Katie Steigleman’s 15.8 PPG. The numbers suggest these two teams are similar. GV averages 72.0 PPG. Corban 68.9. Vikings allow 62.6. Warriors 61.1. GV shoots .431 from field. Corban .425. The most telling stat may be free throw shooting. Grand View makes 74.6% while Corban shoots just 66.4%. The Vikings have also made more from the charity stripe than the Warriors have attempted (540 to 513). #7 Grand View vs #10 Corban scheduled to tip at 8:45 Friday evening. Join myself and Jon Kelly again on 88.1 FM in Des Moines or online here: http://kdpsradio.streamon.fm Go Vikings! 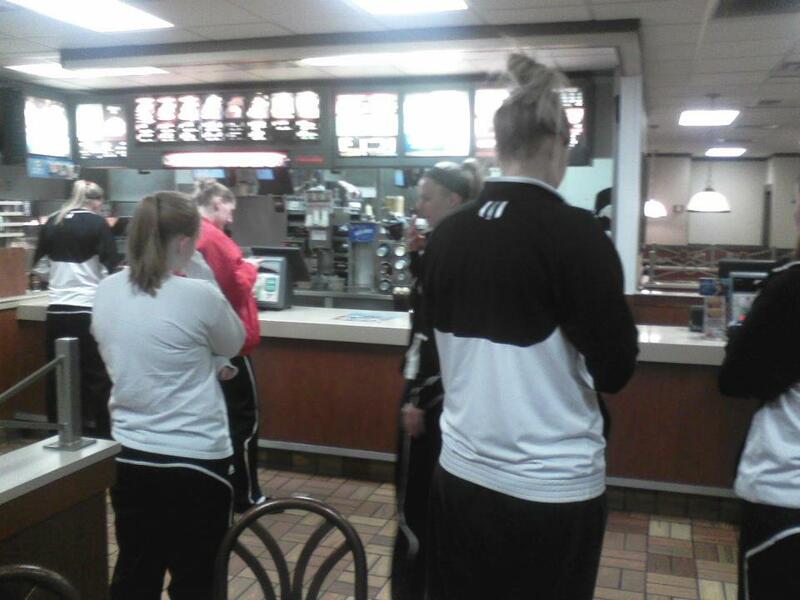 After Thursday night's victory, the team was able to force the South Sioux City, NE McDonald's to open their doors after they were closed to drive thru only.